To measure means to observe or determine the magnitude of variate; evaluation means assessment or appraisal. 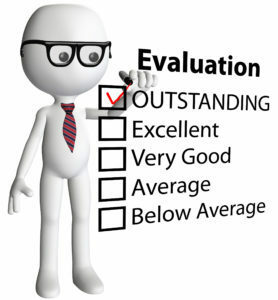 Evaluation is the assignment of symbols to phenomenon, in order to characterise the worth or value of a phenomenon, usually with reference to some social, cultural or scientific standards. Evaluation is a systematic process of collecting, analysing and interpreting information to determine the extent to which pupils are achieving instructional objectives. (i) Systematic collection of evidence. (iv) With a view to action. Let us discuss the importance of each element in defining evaluation. The first element ‘systematic collection’ implies that whatever information is gathered, should be acquired in a systematic and planned way with some degree of precision. For example, in a two year programme in computers, it was observed that almost two-third of each entering class failed to complete the two years programme. On closer examination it was found that most of the dropouts after one year were offered good jobs by companies. The supervisors of companies felt that the one year of training was not only more than adequate for entry and second level positions but provided the foundation for further advancement. Under such circumstances, the dropout rate before programme completion was no indication of programme failure or deficiency. The third element of Beeby’s definition, ‘judgement of value’, takes evaluation far beyond the level of mere description of what is happening in an educational enterprise, but requires judgements about the worth of an educational endeavour. Thus, evaluation not only involves gathering and interpreting information about how well an educational programme is succeeding in reaching its goals but judgements about the goals themselves. It involves questions about how well a programme is helping to meet larger educational goals. The last element of Beeby’s definition, ‘with a view to action’, introduces the distinction between an undertaking that results in a judgement of value with no specific reference to action (conclusion-oriented) and one that is deliberately undertaken for the sake of future action (decision-oriented). Educational evaluation is clearly decision-oriented and is undertaken with the intention that some action will take place as a result. It is intended to lead to better policies and practices in education.